I believe it's safe to say that you are all aware of my love affair with veggies. This recipe caught my eye over on That's so Michelle. I believe her love affair with veggies is just about as passionate as my own. On this particular day she decided to smother her cauliflower with panko and fry them up in coconut oil. How naughty is that! Yes, not really all that naughty considering this whole recipe rocks and it's totally good for you to boot! I believe this calls for a Charlie Sheen. 1. Slice your cauliflower florets. Mix salt, pepper and garlic powder into your Panko breadcrumbs in a shallow dish. 2. Set separate bowls aside with egg whites and cornstarch. Dip your florets one by one into the cornstarch, and shake off excess. Then dip into egg whites, and then coat with Panko mixture. 3. After coating all of your florets, warm up your coconut oil in a large frying pan and place all florets in hot oil. Turn with tongs making sure all sides are browned. Set on top of paper towels to remove excess oil. Top with more salt. 4. In a small bowl mix all of your sauce ingredients. Coat your breaded and pan fried florets with sauce, top with sprinkles of green onion and serve right away. Cooks Note: I did not have the ingredients for the sauce so I skipped it. My foodie friend Jenni from Ferris Wheel Of also has a love affair with veggies and she whipped this dish up as well but she used the sauce as a dipper. Thanks Michelle for sharing such a fabulous recipe! Please go check her out. She has a page dedicated to jello shots! I want to party with that girl! Well you really know how to treat a cauliflower Dee! This looks amazing, love the crunch of the Panko as well as the touch of heat in the sauce. I do agree, this one is a winner-yum! Enjoy the weekend! My husband and I are crazy about bang bang shrimp. 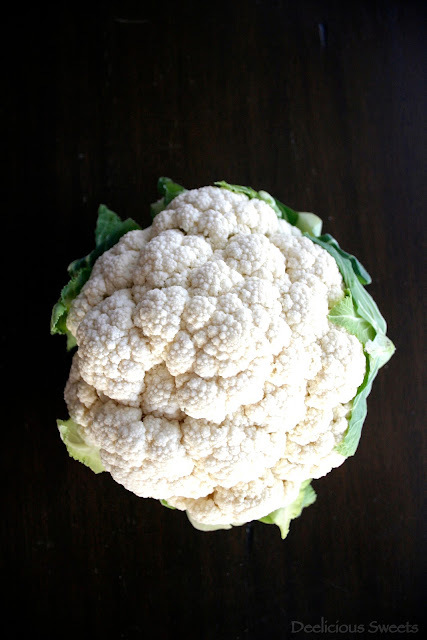 I love cauliflower so I want to try this at home! Yum! Looks fantastic. Love cauliflower. I mean I love chocolate too but for a veggie it's perfection.